Glucerna 1.0 Cal: GLUCERNA 1.0 Cal is a reduced-carbohydrate, modified-fat, fiber-containing formula clinically shown to blunt blood glucose response in patients with abnormal glucose tolerance. 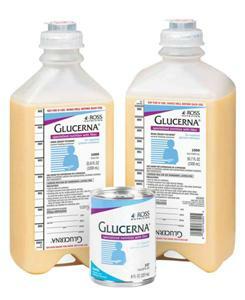 GLUCERNA 1.0 Cal provides only 34.3% of total calories as carbohydrate. This helps minimize glycemic response. The formulation includes soy fiber to help maintain normal bowel function. For patients with type 1 and type 2 diabetes; For patients with abnormal glucose tolerance resulting from metabolic stress, such as illness, trauma, or infection; For supplemental or total nutrition; For tube feeding; 8-fl-oz cans with mild vanilla flavor can be used orally as well as for tube feeding; Not for parenteral use. Features: Consistent with American Diabetes Association and American Heart Association recommendations favoring monounsaturated fats and 4% of calories from saturated fat to help improve lipid profiles; Meets or exceeds 100% of RDIs for 24 key vitamins and minerals in 1420 Cal (1420 mL); Lactose- and gluten-free Vanilla, 8 fl-oz cans; 24/case.